​Time for a bit of fun! In Piece by Piece (Part 1): Creating a Mosaic Base, I discussed making a substrate for a custom mosaic tabletop from a piece of cement board. So, at this point I am assuming that you have some sort of object on which to mosaic, be it cement board, HardieBacker board, Wedi board, concrete or the like. ​​And now the real work begins! It’s always exciting when the prep is completed, and your prepared blank canvas (or HardiBacker tabletop, as the case may be) is set before you awaiting embellishment. Ah, the potential! The endless possibilities! A few materials used for setting the mosaic: rubber trowel, tile trowel, grouting sponge, grout mixing container, bucket of water, spatual. Note: Setting a mosaic is a process that will span a few days (much of it waiting for adhesives and grouts to cure before continuing to the next step), so plan accordingly. Also, in the interest of a fair warning, grouting is a messy undertaking. Using a layer of newspaper over your work surface is not a bad idea. ​Usually, I don’t bother explicitly stating this step. I am sure most of you gather all your materials together before beginning a project, like the good little DYIers you are. However, sometimes I am just so excited to start a new adventure, that I plunge right in before I am completely prepared. (Well, it seems this is the post to admit a bunch of my bad habits!) But, with setting mosaics, please resist the urge to jump the gun. Both the tile adhesive and the tile grout have limited working times. If they become too dry, they will be unworkable. In addition to the materials listed, I also find it helpful to have an extra rag or sponge accessible to help keep my work table a bit tidier. Also, I can’t stress enough the importance of a nice bucket of water for keeping the area, and your hands, clean while working. I use a one-gallon repurposed paint bucket, which seems to be the perfect size for me. 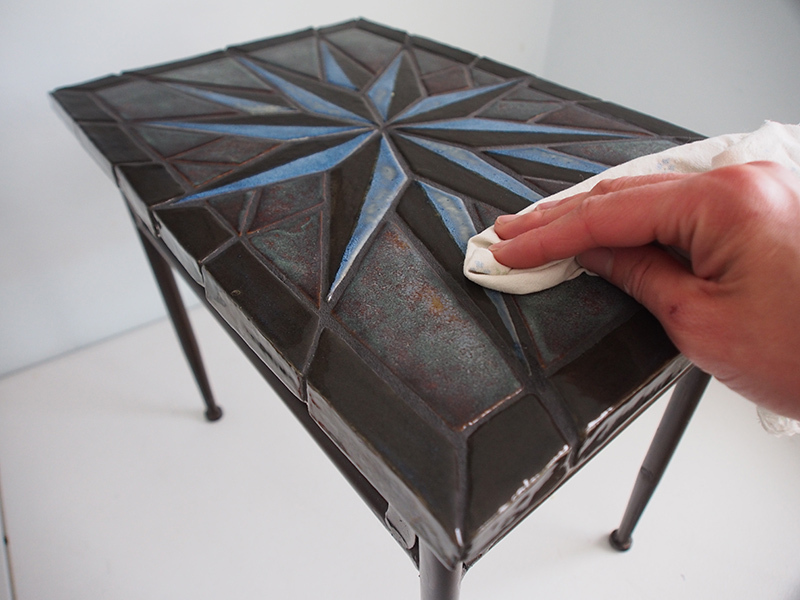 ♦ Ensure the mosaic backer board is clean. Cutting the cement board generates a bit of dust, especially if using a jig saw. 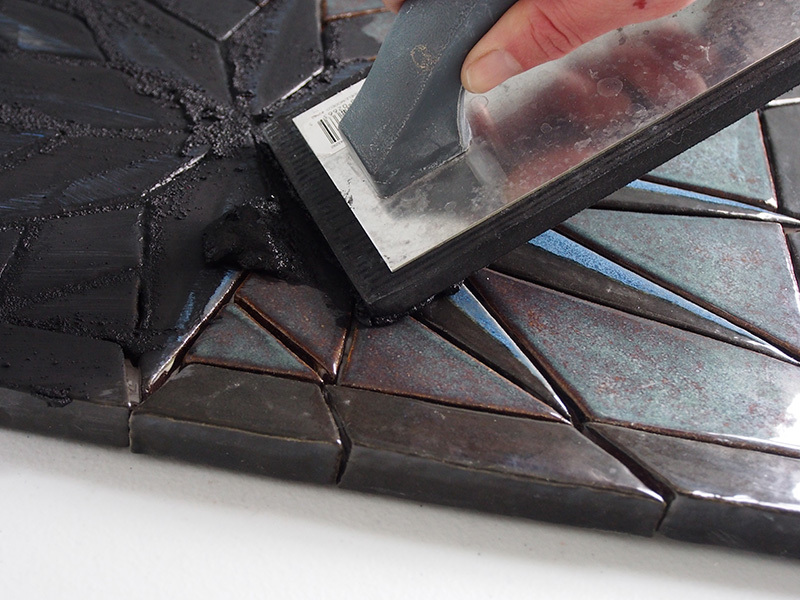 Therefore, before setting the mosaic, make sure all the dust has been cleaned from the substrate. I vacuum the board, especially if I have used a jig saw to cut the piece, and the wipe it down with a damp cloth. ♦ Lay out your mosaic pieces. Before beginning to set the mosaic, I like to lay the pieces on the cement board just to make sure everything fits as expected and I have not made my cuts incorrectly. It also gives me a good idea of spacing between tiles. Hopefully, I have made my calculations accurately, and the grout lines of my mosaic are correct. If everything looks as it should, I then lay the pieces in their pattern next to my mosaic substrate so they are easily accessible and I don’t have to spend time searching for the next piece to set. 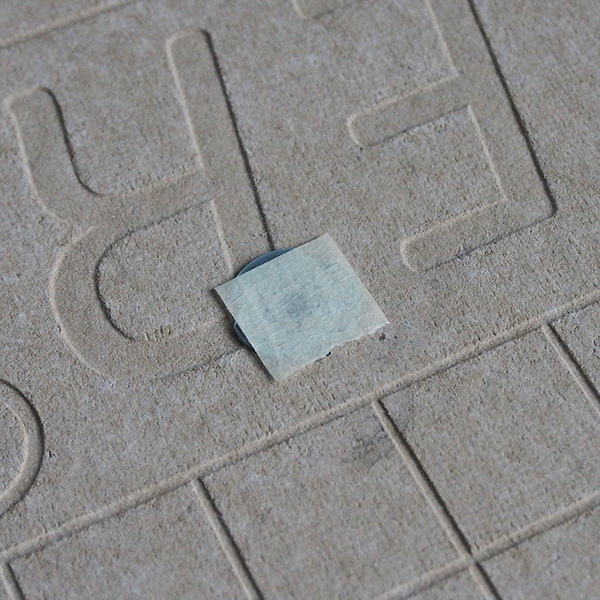 ​There are a couple of adhesive options used to affix the mosaic pieces to the cement board. For many of my mosaic projects, I use the premixed tile adhesive because sometimes I can be a bit lazy. I don’t create too many mosaics on a regular basis, and my mosaics are fairly small in area, so a gallon bucket of tile adhesive that I can just crack open without any hassle when I need a little, is perfect for my needs. Premixed tile adhesive (1 gallon bucket). ​Of course, there are also drawbacks to the premixed tile adhesive. It should not be used for outdoor projects, or anywhere that will see repeated contact with sustained amounts of water (be sure to read the back label for installation recommendations). Also, the premix is more of a mastic than a mortar, and as such it takes quite a long while to cure completely (up to a number of weeks, especially for larger tiles). 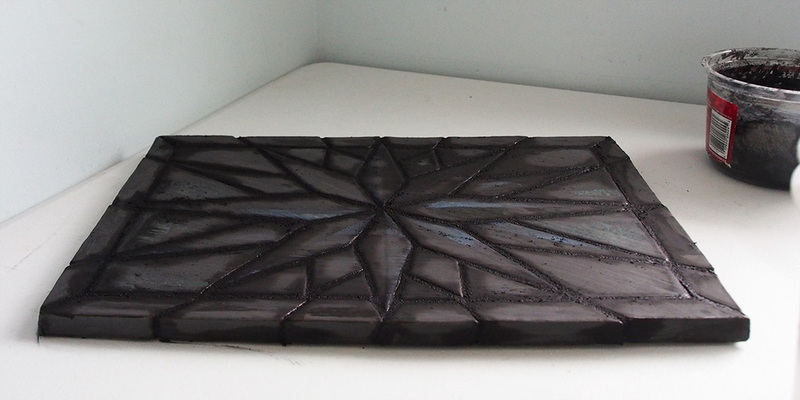 Latex-modified Thinset tile mortar (50 lb dry). Unmodified Thinset tile mortar (50 lb dry). ​If you have an outdoor project, a piece that will be subject to significant amounts of water, or have a large area to mosaic, go with purchasing a bag of dry thinset tile mortar. 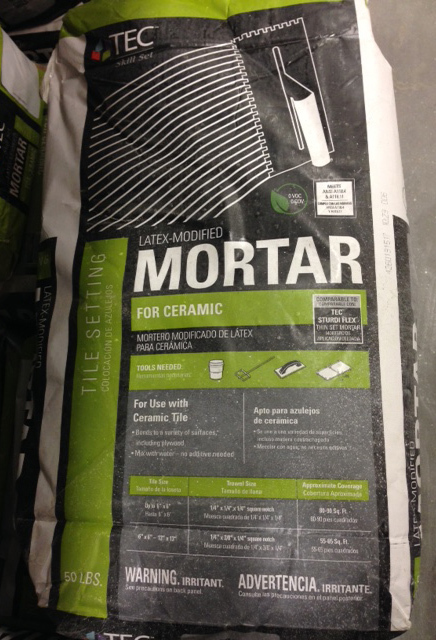 A 50 lb bag of mortar will run a bit less than the premix, depending on the type you purchase, so you have the added bonus of saving a buck or two. The dry mortar will have to be mixed with water before use, adding another step to the process. 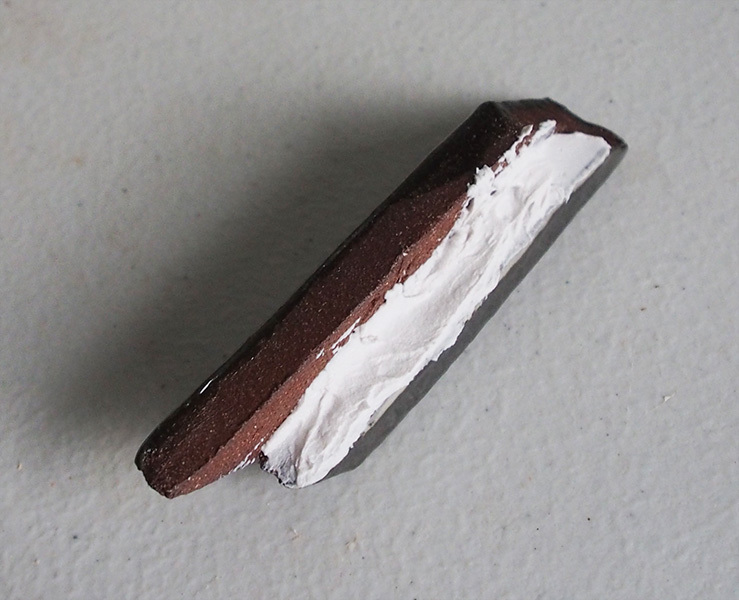 Tip: Thinset mortar may come modified with a latex additive, or unmodified. 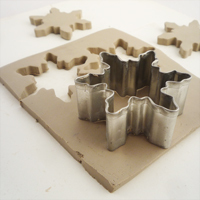 The latex adds a bit of flexibility and increased adhesion to the mortar. ♦ Cover the T-nut holes. We will be setting our mosaic right over the faces of the T-nuts. In order to prevent tile adhesive or mortar from filling in the barrels of the T-nuts (which would make it difficult to screw anything into them), I apply a small piece of masking tape over the hole. Cover the T-nut with a small piece of masking tape to prevent mortar from sealing the screw hole. 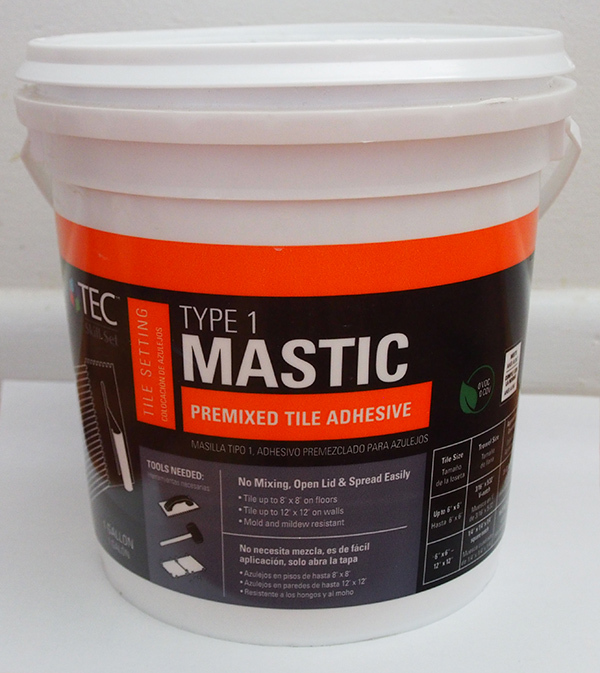 ♦ Prepare the tile adhesive / mortar. 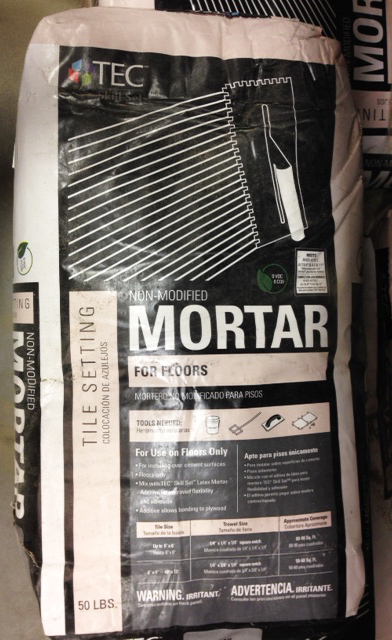 If you are using dry tile mortar, prepare the amount of mortar needed for your project according to the instructions on the bag of mortar. Since mortar is a cementitious material, the instructions for preparing the mortar will be similar to, though, perhaps not exactly the same as, the instructions for preparing the grout (listed below). There are some handy online calculators that help to estimate the amount of mortar needed for a project. ​If you are using the premixed tile adhesive, just open the bucket! The added benefit to the premix is you don’t have to estimate mortar needs for a specific project, and there should not be any adhesive waste. 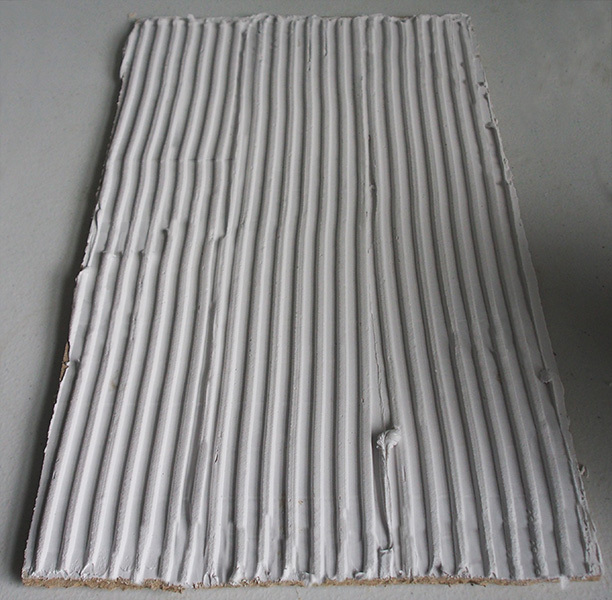 ♦ Apply the tile adhesive / mortar. Using a small spatula or trowel, apply the tile adhesive or mortar to the cement board (the textured side if using HardieBacker). I scoop a bit of adhesive from the container and plop it onto my board, spreading it out with the spatula. I am careful around T-nuts so that I do not inadvertently dislodge the masking tape protecting the screw holes. 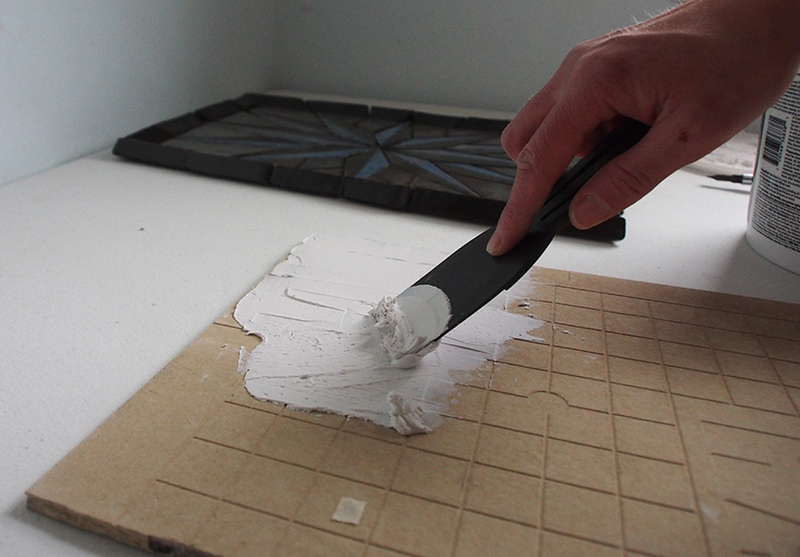 Using a small plastic spatula to spread the tile adhesive on the backer board. ​Since my mosaic is small, I apply the adhesive to the entirety of the backer board at the same time. If you are tiling a wall or other large area, it is easier to apply the mortar to a smaller, workable section and set the tiles of that area before moving on to an adjacent section. ​After coating the cement board in adhesive, I use my trowel to even it out to the desired thickness, as specified on the back of the bag or pail of mortar. Tile adhesive applied to the mosaic backer board and evened out. ​♦ Notch the adhesive / mortar. 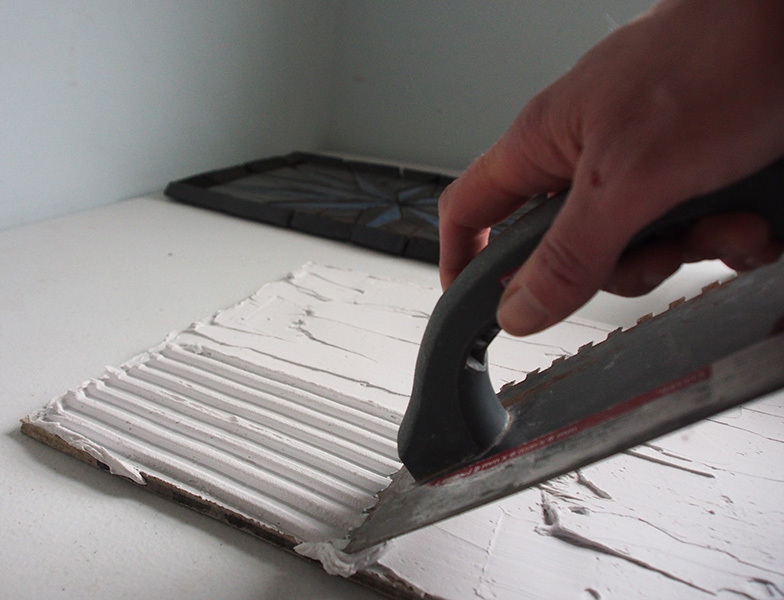 Hold the notched tile trowel at a 45-degree angle to the tile board and pull towards yourself with even pressure to create grooves throughout the mortar. The premix adhesive I am using suggests using a V-notched trowel of size 3/16” x 5/32” for tiles less than 6” x 6”. Unfortunately, I only have a square notched trowel handy, so that’s the one I am going to use. My tiles are irregularly shaped, with some larger, and some smaller, and some over 6” long, so I don’t think that the square trowel will present much of a problem. Notch the tile adhesive or mortar with a tile trowel. Grooved tile adhesive on the mosaic backer board. Note: Choosing the correct trowel size can be a bit confusing. Check out The Floor Elf’s post Using the Proper Towel, which explains clearly the differences between trowel sizes and when to use each. This post suggests using a V-notched trowel for tiles smaller than 2”. ♦ Mark guides as needed. Before I start laying the tiles, I like to add a few guides to help me with spacing. Since this mosaic is symmetrical, I mark the center points on each side by making a tiny notch in the mortar. For this mosaic I begin laying the tiles from one corner. Your starting position may vary depending on the design. Sometimes starting from a side or the middle makes sense, so plan ahead to determine which will work best for your particular mosaic. Placing the mosaic pieces beginning in the left corner of the board. 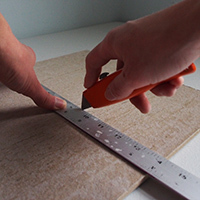 ​Place the tile onto the adhesive-covered backer board. Since I began with a corner piece, and I am confident that this is the final position for the tile, I apply pressure to the tile using a bit of a wiggling motion to set it firmly into the mortar. The correct amount of pressure is key. You want the tile firmly set, but you still want a bit of thickness to the mortar. ​As mentioned above, I just eyeball the spacing for my tiles. After the first corner tile set, I place subsequent tiles without pressing them into the mortar so that I can easily make minor adjustments to the positioning. ​To aid in proper spacing, I may also jump from section to section of the mosaic. For instance, I began with placing a few pieces in the left hand corner of the tabletop. I then set a few tiles in the other 3 corners before filling in the center of the mosaic. Jumping from one section of the mosaic to another can help with setting the pieces evenly. Note on Spacing: There are tile spacers available from local home improvement stores that allow for even spacing between tiles when laying floors or walls. 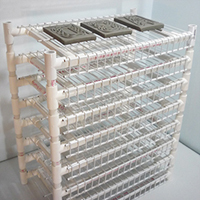 These can be used for mosaic applications if you are really concerned about perfect grout lines between your tiles. For the most part, however, I just eyeball the spacing between my pieces as I set them. 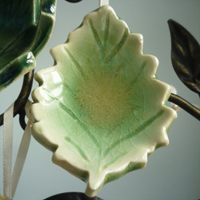 My tiles are all handmade, and due to their handmade nature, each has slightly different dimensions. Since they are not the even square tiles you can buy commercially from your local big box store, the spacers don’t tend to work as well. ​♦ Back buttering tricky tiles. My border pieces, designed to wrap around the edge of the cement board, are shaped like an L with a 90-degree angle. Since the edge of the substrate is so thin, I decided to butter the back of the tile with adhesive instead of applying the adhesive for these pieces to the edge of the board. Back buttering is a good technique for areas where it is difficult to apply mortar. The underside of one of the edge pieces (the profile is a backwards L shape). 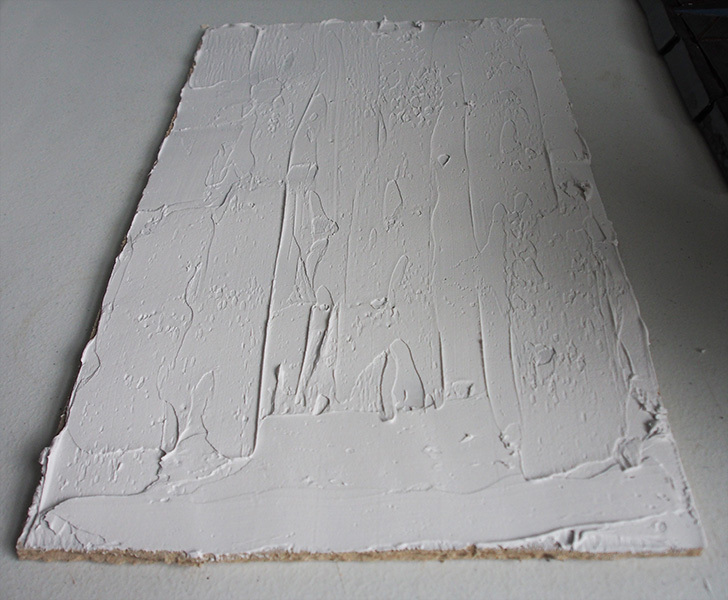 Tile adhesive applied directly to the back edge of the ceramic tile (back buttering). ♦ Make all final positioning adjustments. Once all the tiles are placed on the backer board, I take a step back and look at the spacing of the pieces. I find that a few minor adjustments are usually required to even out the widths of the grout lines. 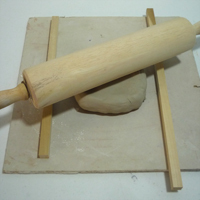 Even if the tiles have not yet been pressed firmly into the mortar, they are difficult to unseat completely and pick up, and usually you don’t have to. The tiles can be slid slightly in the mortar to accomplish the correct positioning. All the mosaic pieces have been placed on the tile board. I will now go back and even up the spacing as needed. ♦ Firmly seat all tiles. 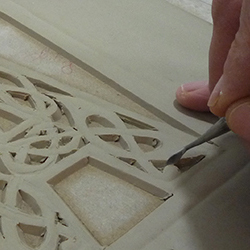 Once the mosaic pieces are in their final positions, press each firmly into the mortar, obtaining a good seat. While seating the tiles make sure that they are level with their neighbors, adding more pressure if they are higher. You will find that sometime the mortar resists leveling the tiles a bit. If this is the case, one trick is to place a straight piece of dimensional lumber (a 2x4, or something similar) over the problem tile and spanning its neighbors on both sides. Using a rubber mallet, gently tap the board until the tiles are level. 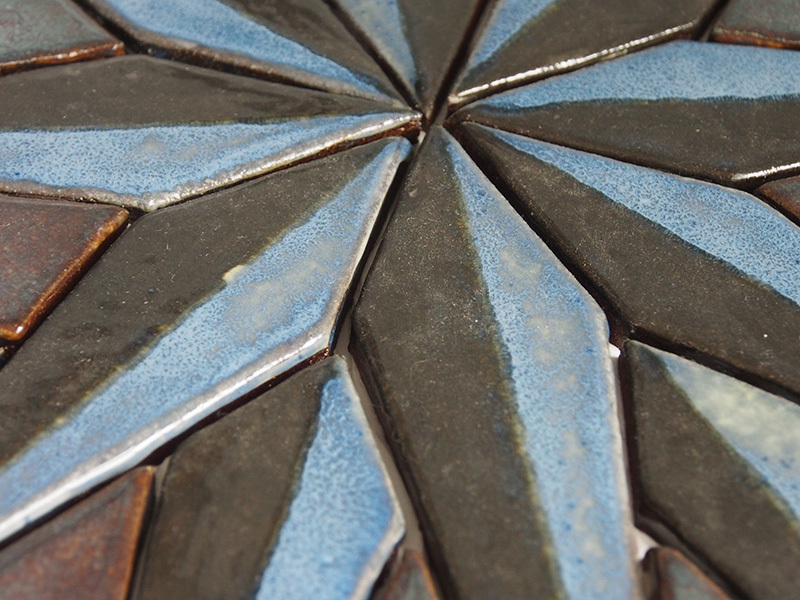 Closeup of the mosaic tiles in their final positions. Tip: Make sure the mortar doesn’t ooze too far up the cracks between the tiles. The mortar should fill no more than 1/3 of the space to ensure proper grout strength. If there is too much mortar in the gaps, use an implement like a wooden kitchen skewer to clean out the excess. Usually, my mosaics are fairly small in area, and my pieces are on the larger size, so I just lay them as I go. However, if your mosaic has hundreds of little tiles that will take a million years to piece together, there are a couple alternate methods available that help to reduce the setting time and still ensure proper spacing. For instance, the tiles can be glued to a fiberglass mesh with an adhesive like Weldbond prior to setting on the cement board. With all the pieces firmly in place on the mesh, the whole ensemble is then pressed into the mortar on the mosaic substrate. 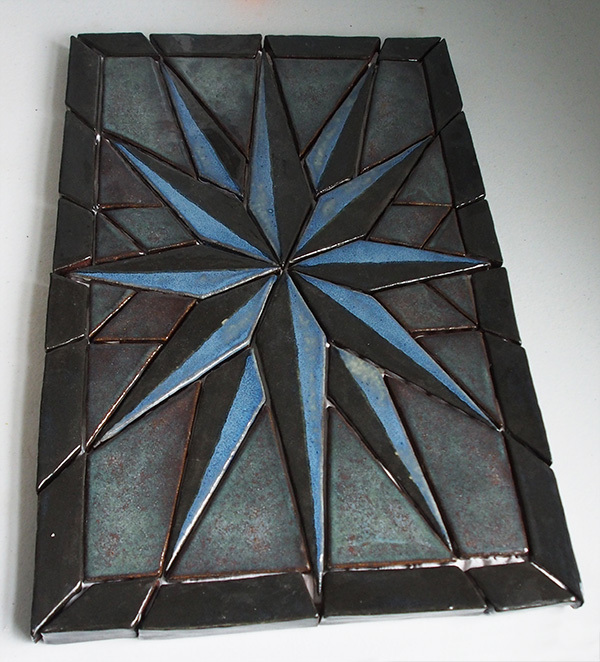 Another option, called the reverse or indirect mosaic method, includes adhering the tiles face down to paper using a temporary, water based glue. After the tiles are set into the mortar, the paper is removed from the top of the tiles. Interested in more information about the different mosaic techniques? Check out my resources page for book and website suggestions. ​Your tiles are all in place, and your mosaic is starting to look like a mosaic. The perfect time to take a break! Before grouting the mosaic, the mortar or adhesive needs to cure for a while. Curing allows the mortar to firm up and gain strength. Following the instructions on the mortar package, allow the appropriate amount of time before continuing. The amount of time will vary depending on the thickness of the mortar and your tile size, but as a good rule of thumb, I like to wait at least 24 hours before grouting. It’s time to fill in the cracks! After waiting the requisite day or so, let’s get to the grouting. Again, grouting is a time sensitive process, so gather all your materials before you begin. And don’t forget your bucket of water and extra rags! 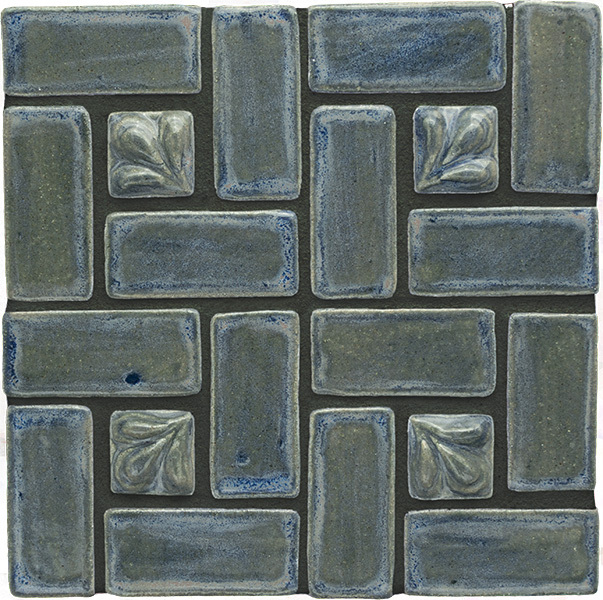 ♦ Choose a grout color. 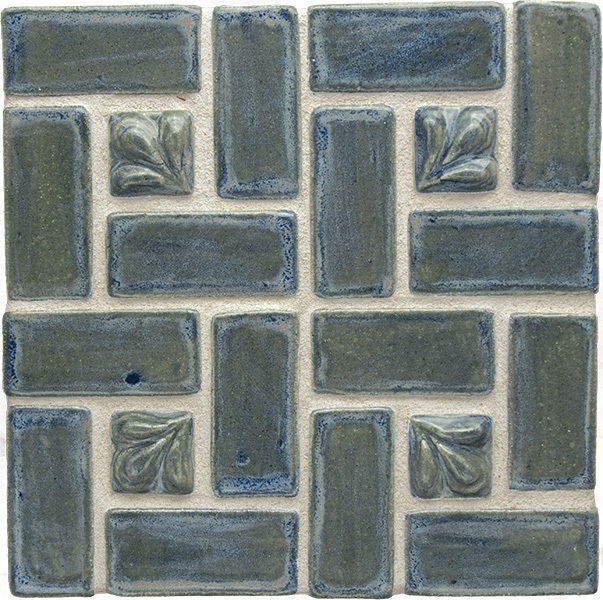 Grout is available in a variety of colors. My local home improvement store stocks black and white grout, as well as a few shades of gray, off-white and brown. Additionally, colorants can be added to white grout to create an unlimited number of shades. In my studio, I keep a small box of black, white and light brown grout, and I can combine these to form any number of grays and lighter or darker browns. Various colors of commercially available grout. 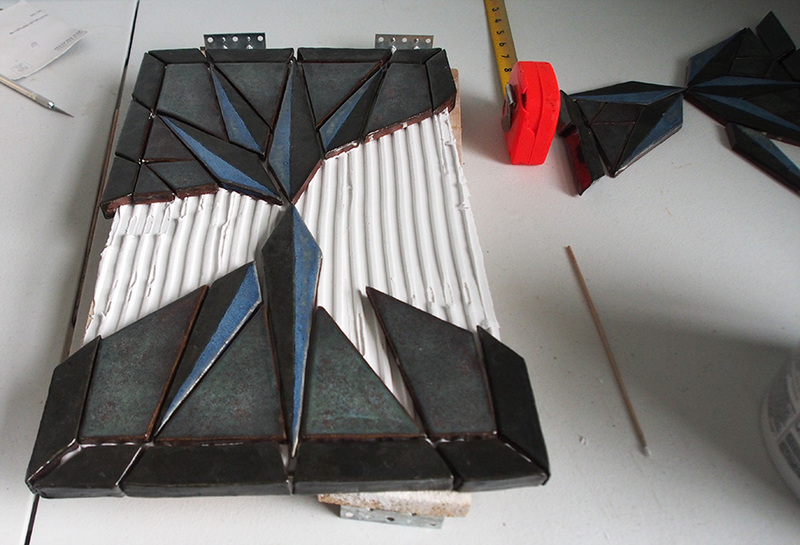 ​The choice of grout color greatly impacts the final look and feel of the mosaic piece. The same piece grouted with white as opposed to black grout will drastically change the whole mosaic. 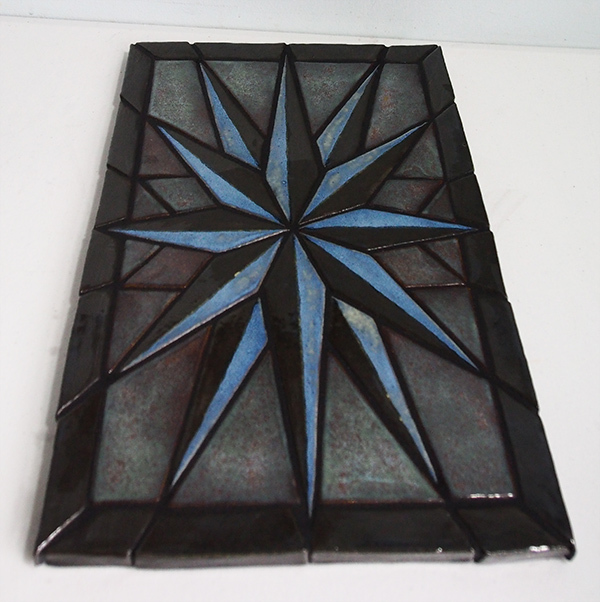 Do you want the grout lines to blend into the piece, or do you want them to catch the eye? Would you like the grout color to pick up on colors in your tiles, or contrast with those colors? There is a lot to consider, because the grout lines are part of the design, just as the tiles are, and I often have trouble deciding what grout color will look the best. Tiles grouted with light gray grout look very different from the same tiles with a darker grout. The same tiles grouted with a charcoal gray grout accent different colors. ​Also, there is no law stating you are only allowed to use one grout color per project. It may take a bit more work, but you can grout different sections of your piece with different colors as the mood strikes you. ​In order to help with the grout color choice, you can mix small batches of a few colors: black, white, gray and brown. Let them cure and use them as color swatches against your tiles for comparative purposes. 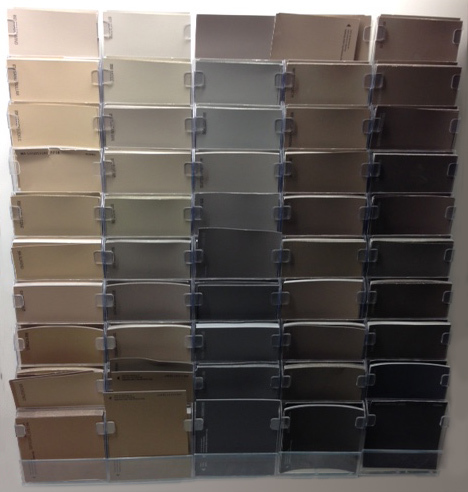 Commercial available grout color swatches. ​Still stuck on a grout color? Think about using a photo editing program to help pick the grout color. Take a picture of your mosaic pieces set against a white background with spaces between the pieces mimicking the future grout line. In the photo editing software, change the white color to the other options for your grout color and see which looks best. ​I chose a black grout for this mosaic project. My tiles are dark and I did not want to have the grout lines too pronounced. Sanded or Unsanded Grout? The sand in sanded grouts helps to combat shrinkage and cracks as the grout dries. If your grout lines will be less than 1/8” thick, the shrinkage should not be much of a problem, and unsanded grout can be used. For grout lines thicker than 1/8”, it’s a good idea to use sanded grout. I use sanded grout for most of my mosaics. Safety Note: Mixing grout is a dusty process. Please wear a dust mask or respirator to protect your lungs. ​As with the mortar, tile grout comes in premixed buckets, as well as in various quantities of dry powder. Unlike the tile adhesive, I use the dry grout over the premixed versions since it is easier to mix to form custom colors. ​♦ Measure out the desired quantity of grout. Using my studio scale, I measure out a pound of dry grout into one of my plastic mixing pails (in this case a repurposed food container). If you don’t have a scale handy, you can always measure the grout by volume. Mix your grout in small, usable quantities. If you have a larger mosaic, only measure out enough grout for about 20 minutes of work. After that time, the grout begins to set up and can no longer be worked effectively. For custom mosaic pieces it is sometimes difficult to estimate the amount of grout you will need. The quantity of grout required will vary with the width of the grout lines as well as the thickness of the tiles, and of course the area of the piece. In fact, I over estimated the amount of grout I would need for this project, and had some extra once the mosaic was grouted. Luckily, I had a couple other un-grouted pieces waiting in the wings that were appreciative of the leftovers. ♦ Measure out the water and mix with grout. 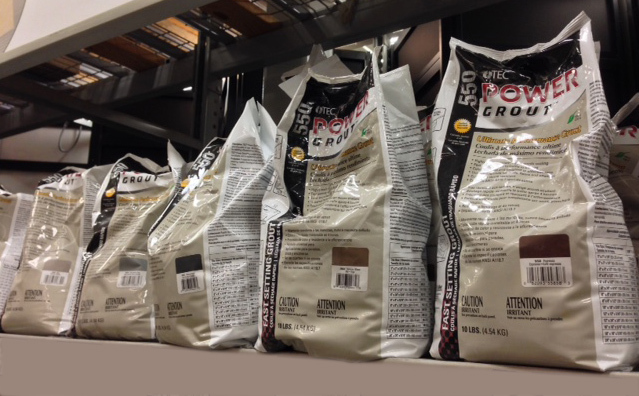 The grout package will indicate the ratio of dry grout to water. Usually, the quantity of water listed is for the entire package of grout, so you will have to do a bit of math to figure out how much water you will need for a smaller quantity of grout. ​For example, my grout calls for 26 oz water for the full 10 lbs of grout. Since I am only using 1 lb of grout, I will need on 2.6 oz of water. 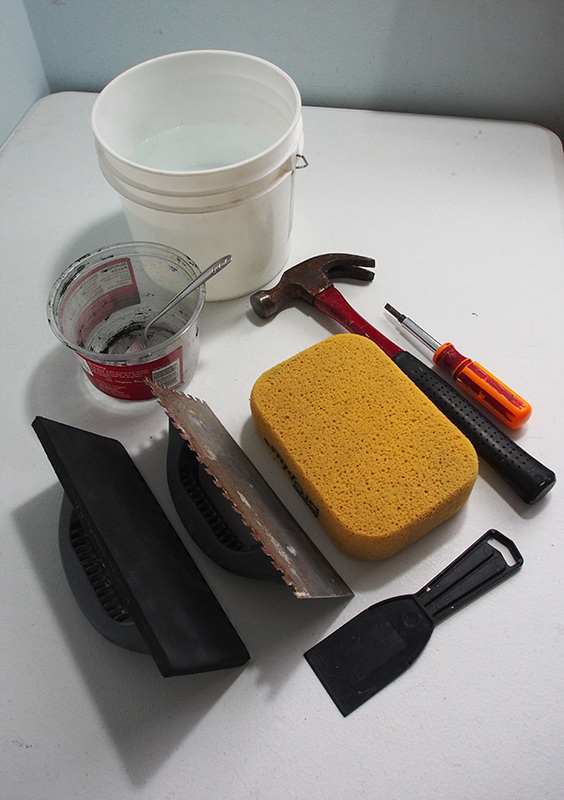 ​Begin mixing the water by hand into the grout with your mixing implement. I use a random spoon I had lying around the studio, and the professionals recommend trowel, but really anything will work. At the beginning of your mixing, the amount of water will seem like too little for your quantity of grout. I ask you from a position of experience, please resist the urge to add more water! Just keep mixing, and the grout will start to take on its correct consistency, that of peanut butter or thick cake frosting. If you do find you need to add more water, add it drip by drip – a little goes a long way and it is all too easy to add too much. ♦ Let the grout rest. Following the instructions on the grout package, let the grout rest for the required amount of time (5-10 minutes in this case). Resting allows the grout particles to evenly absorb the water. 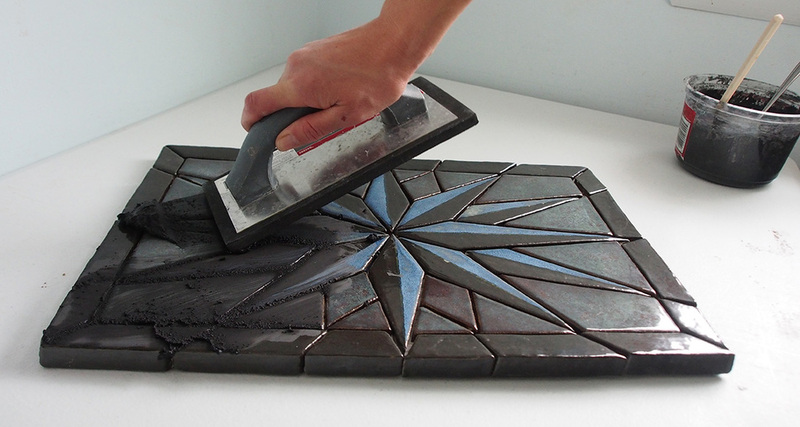 ♦ Work the grout into the spaces between the tiles. After placing a blob of grout onto the surface of the mosaic, use the rubber grout float to work the grout into the gaps between the tiles. With the rubber trowel held at a 45-degree angle, press the grout firmly into the spaces, ensuring that the grout fills the entire crack from top to bottom. Don’t worry about getting grout on the face of the tiles – it’s a messy process; this will happen. Work your way around the entire piece, replenishing your grout as needed. Using a rubber trowel float to work the grout into the spaces between the tiles. 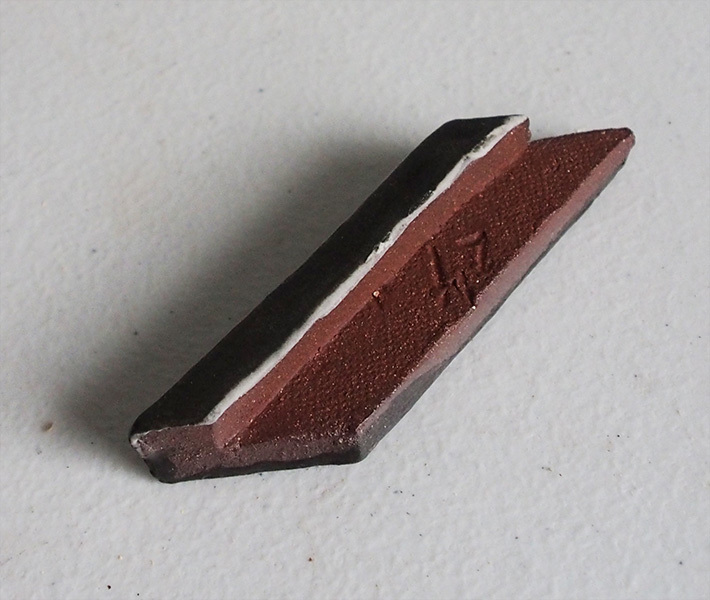 Closeup of the grouting process using a rubber float. After all the gaps have been filled, use the rubber trowel to clean away any excess grout from the surface of the tiles. Don’t worry about removing all the grout – that’s for the subsequent step. All we are concerned with here is brushing away large chunks and ensuring that the grout is fairly flush with the edges of the tiles. The tiles will still be hazy. 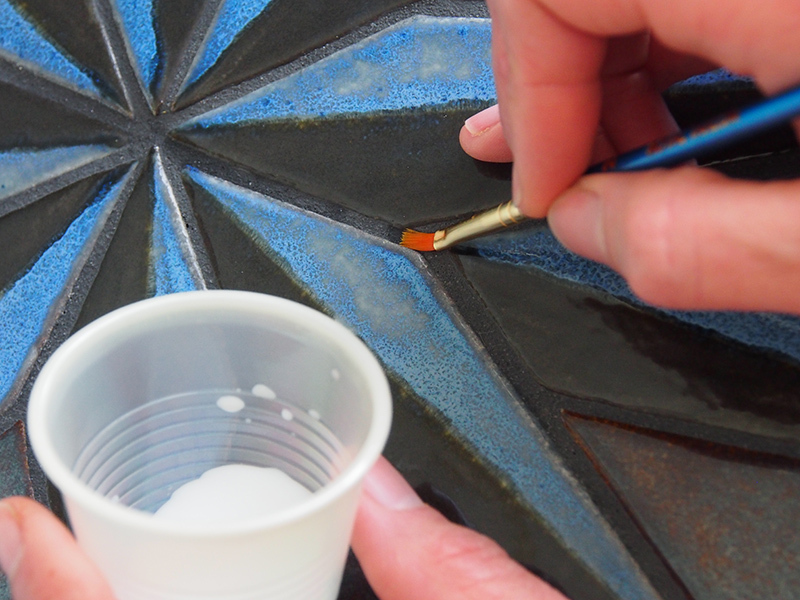 After the grouting is complete, remove any excess grout left on the surface of the mosaic with the rubber float. Tip: In recent months I have created some high relief tiles with irregular surfaces of varying heights. I have found that a rubber trowel does not really work with these tiles at all due to their non-flat faces. Therefore, I have used a pad of folded cheesecloth as an alternative to the rubber grout float to work the grout into the spaces between tiles. 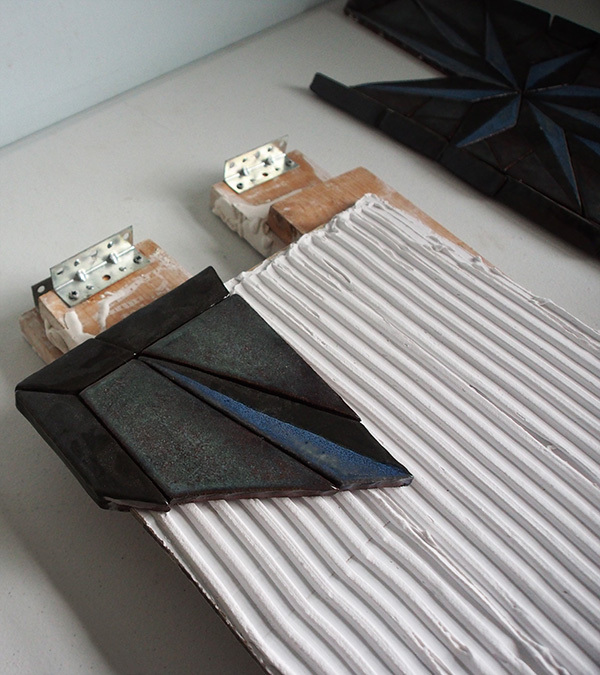 Using a pad of cheesecloth instead of a rubber float to grout high-relief tiles with surface variations. Working the grout between the high-relief tiles using a pad of cheesecloth. ​Another brief break before cleaning, according to the package label (in this case 15-30 minutes), as the grout firms up a bit. Allow the grouted mosaic to rest for about a half an hour. Notice that there is a significant haze of grout still remaining on the surface. 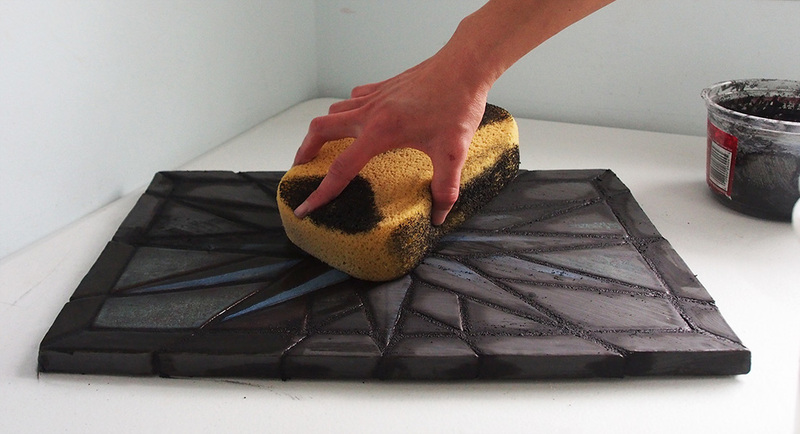 ​Most people use a large sponge to remove the excess grout from the face of the tiles. However, you can also use a pad of cheesecloth to clean the mosaic. In fact, the Ceramic Tile Institute recommends cheesecloth over a sponge for the cleaning step for a number of reasons, including better looking grout lines (read the full report on cheesecloth and grouting). And after a number of recent projects using cheesecloth instead of a sponge, I must pronounce that I am a convert. 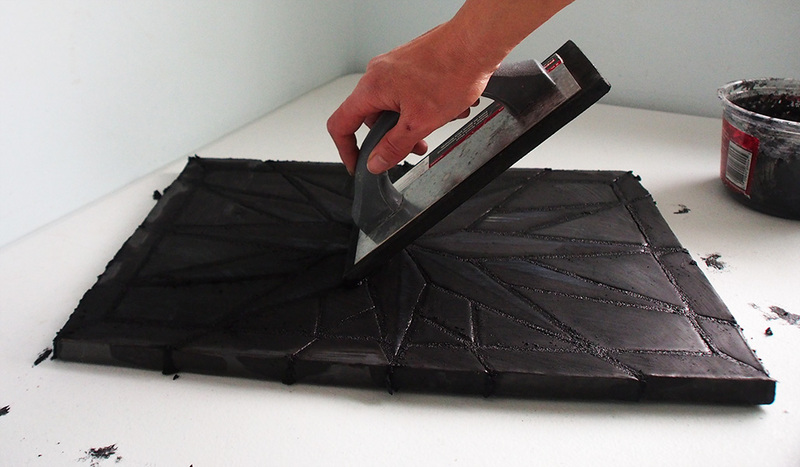 ♦ With a damp sponge or pad of cheesecloth, wipe the surface of the tiles. Make sure you have wrung out as much water as possible from the sponge or cheesecloth since you want to introduce as little water as possible to the mosaic at this point to prevent weakening the grout. This is easily accomplished with the cheesecloth (which is another reason the Ceramic Tile Institute recommends it), but even after wringing, a significant amount of water is left in a sponge. 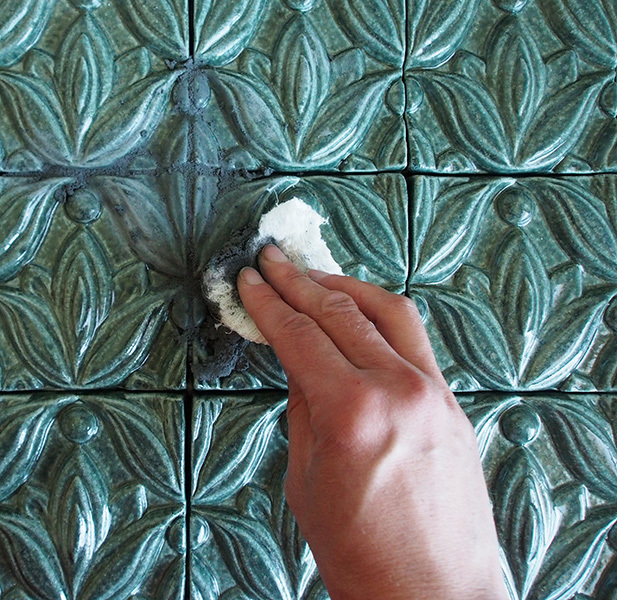 Using a piece of cheese cloth to clean the grout from all the nooks and crannies of the high-relief tiles. My new favorite method. ​Use the sponge or cheesecloth to swipe once across the mosaic surface, moving perpendicular to the grout lines to avoid removing any grout from the lines themselves. Cleaning the mosaic is like unwrapping a birthday present, as you finished design begins to appear from under the grout haze. ​After swiping once, you can turn the sponge or cheesecloth over and swipe a second time. However, do not go over the tiles with a dirty surface. 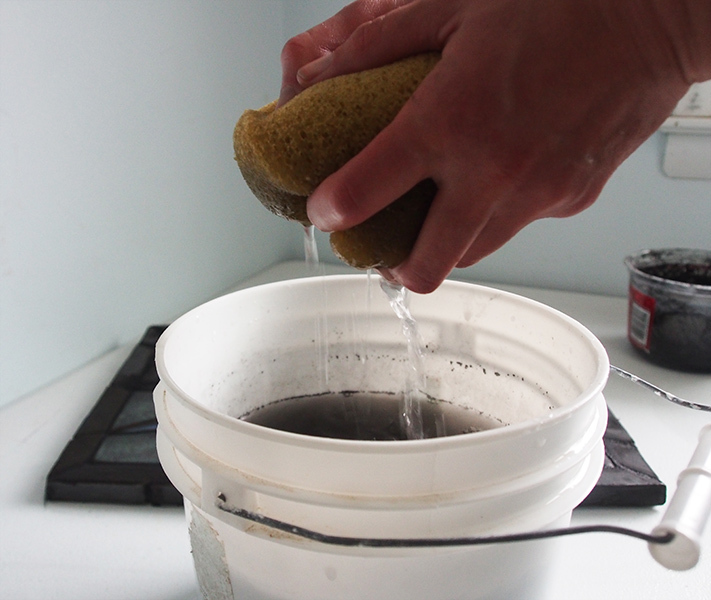 Rinse your sponge or cheesecloth in your bucket of clean water, wring out, and swipe again. Repeat the process until you have cleaned the grout haze from the entire piece. Wringing out the grouting sponge. ♦ Check the surface and spot clean as necessary. At this point, I like to check my work. I take a look at the surface of the mosaic to make sure that there are no obvious grout streaks or hazy patches. I also take a look at the grout lines. Common practice states that the grout should be flush with the edge of the tiles. Clean up any grout lines where the grout lines encroach onto the surface of the tiles. Personally, I like the appearance of grout lines that are slightly concave (a very shallow U shape when looked at from a cross section) and show the tiniest bit of the edge of the tile. 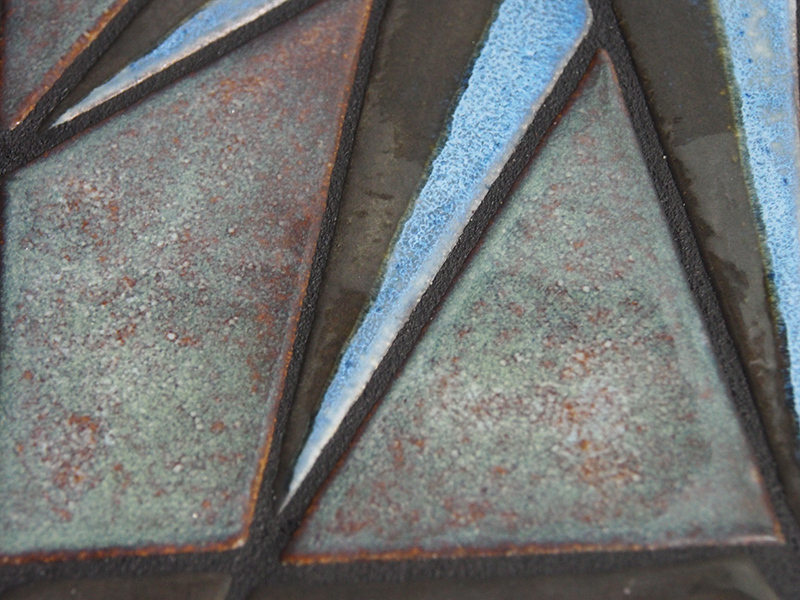 A lot of my glazes break a bit at the edges of the tile and have a slightly different color, almost like a highlight or outline, which I like. So during the cleaning process I remove a little of the grout from the grout lines as necessary to achieve this look. As a disclaimer, I must state that this is only my preference, and varies from the accepted "right" way to grout. A closeup of a section of the cleaned mosaic. I have removed a bit of the grout so that the grout lines are just slightly below flush with the tiles, and the tile edges are visible. ​Following the directions on the grout package, allow the grout to cure for the recommended amount of time, usually 24 hours. ​Even after cleaning the tiles as explained in Step 9, there may still be the faintest grout haze left on the surface of the mosaic. Enter the cheesecloth once again. 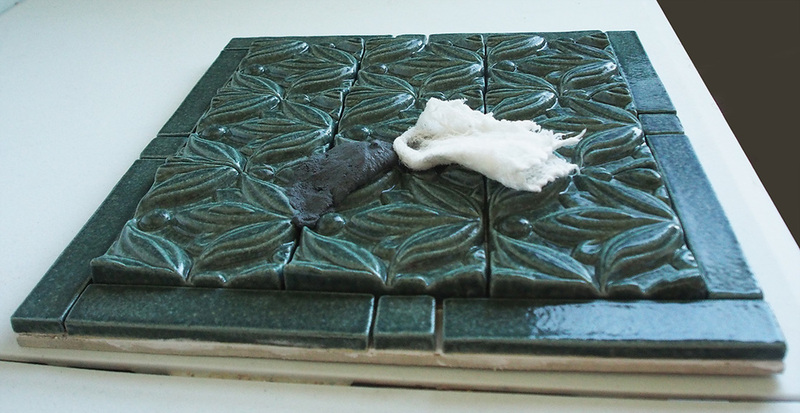 ♦ Buff the surface of the tiles with a pad of cheesecloth. While gentle on the face of the mosaic, cheesecloth has just enough texture and abrasiveness to remove any residual haze (within reason) that may be left from the grout. 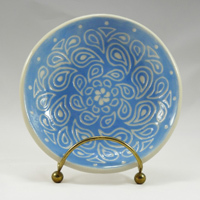 ​Pressing firmly and using a circular motion, rub the cheesecloth pad across the surface of the mosaic. Buffing the surface of the mosaic with a pad of cheesecloth to remove any residual grout haze left after cleaning. ♦ Optional - Use a commercial tile cleaner for grout dried on tile surfaces. This should never happen! If you have paid attention to detail and cleaned the grout from the surface of the mosaic properly, you will never run into the problem of irremovable haze or chunks of grout stuck to the surface of your tiles. However, maybe due to some unforeseeable circumstance you were forced to leave your mosaic only half cleaned. Or perhaps you hired a contractor who dropped the ball on the grout cleaning stage of tiling and left behind a mess of dried grout all over a 400 sq ft floor (yes, this happened to me). ​Never fear, there is a way to remove the inconvenient grout: muriatic acid. I have found it in my local home improvement store marketed as a ceramic tile and grout cleaner. It works wonders, and even diluted (as the instructions recommend) it will remove cementitious material from the surface of ceramic tiles. It will also remove the grout from the grout lines, and can etch the tiles themselves if left on too long, so follow the directions on the container. Safety Note: Muriatic acid is, as its name suggests, an acid and thus caustic. Wear protective gloves and eye goggles when handling. 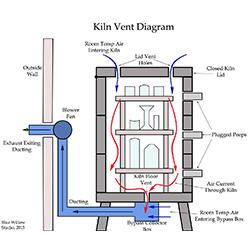 Mix and use outdoors or in a well ventilated area as the fumes can cause irritation. 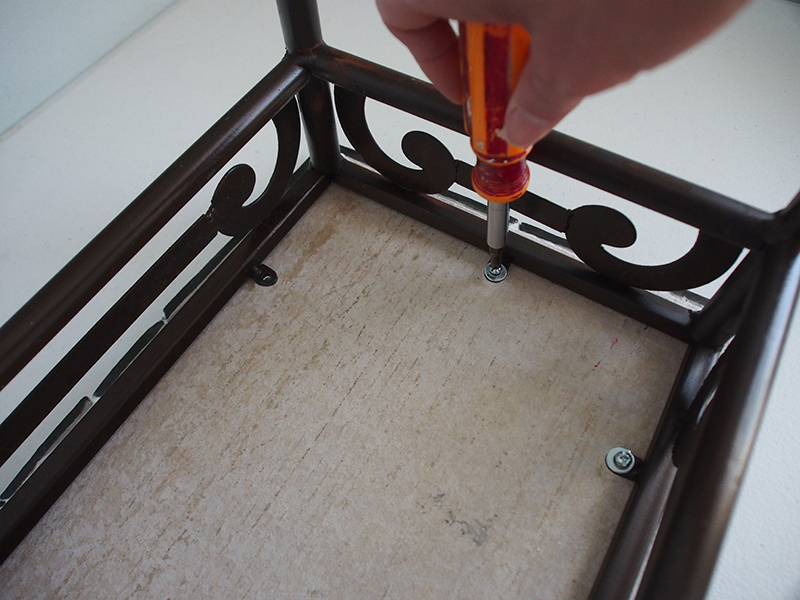 ​Since my table is fairly small, I was able to reassemble it on my workbench. I flipped the mosaic face down on the work table, set the base on top and screwed the two pieces together. ​The T-nuts have a shank height of ¼”. However, the screws I have handy are slightly longer at 3/8”. If I were to screw them directly into the T-nuts and tighten, they would extend through the base and possibly pop a tile off the front. The attachment flanges on the base provide a bit of a spacer, but to be on the safe side, I also added a washer between the screw head and the flange. Mounting the newly-mosaiced tabletop to its base. Note the washers between the screw heads and the flanges. ​An optional, but highly recommended step, especially for light-colored grouts. Grout sealer prevents the grout from staining, and allows the easy cleanup of dirt. Even though my grout lines are black and will hide a lot of grime, I chose to apply grout sealer. As with the mortar and grout, follow the instructions on the container for best application procedures. The grout must cure for 48 hours before applying the sealer. ♦ Check the grout sealer fit. The manufacturer recommends that the sealer be tested on a small area of the grout and tile to make sure that there is no discoloration. ♦ Using a paint brush, paint the grout sealer onto the grout lines. 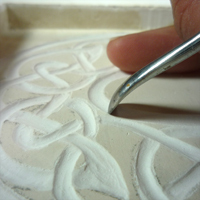 Sealer leaves a waxy white haze on the surface of the tiles if left to dry. Therefore, I like to be as neat as possible when applying the sealer to the grout lines. I have found that using a paintbrush with a width close to the width of the grout lines works well to keep the surfaces of the tiles free from the sealer during the application. Applying grout sealer to the grout lines using a paint brush. I like pouring a little grout sealer from the container into a small plastic cup for ease of use. ​Apply 1 to 3 coats of sealer, waiting an hour after each coat. 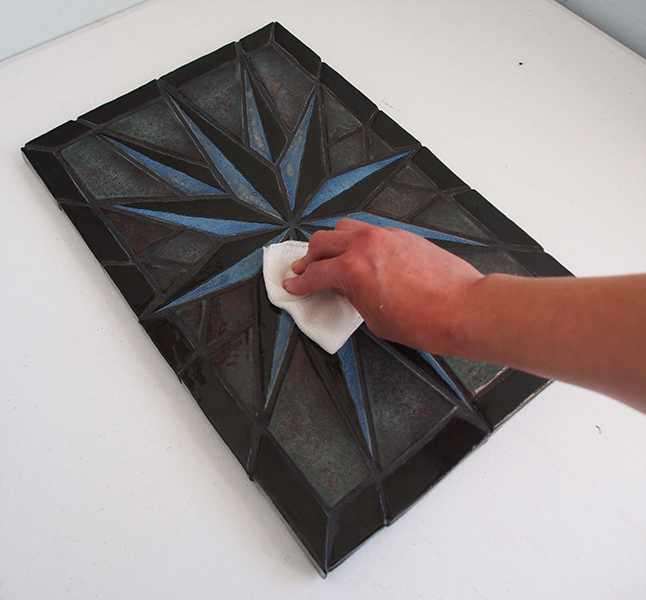 Promptly wipe up any sealer from the face of the tiles with a rag. The grout lines are completely sealed when water does not absorb into the grout. The sealer will cure completely within 24 hours. 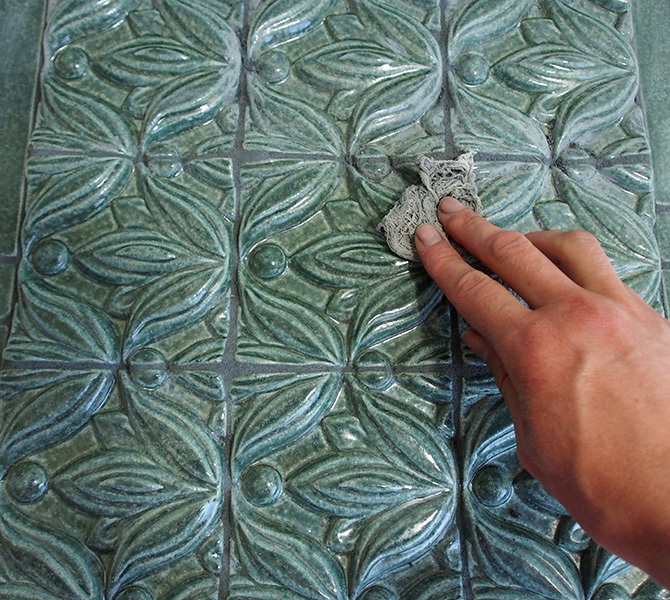 With a clean rag, wipe off any grout sealer from the surface of the tiles. If left to dry, it will leave a white haze on the mosaic face. 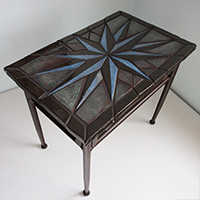 ​Mosaic tabletop completed? Check! And now pardon me while I jump up and down ecstatically. Ha, Monster To-Do List, I will vanquish you yet! 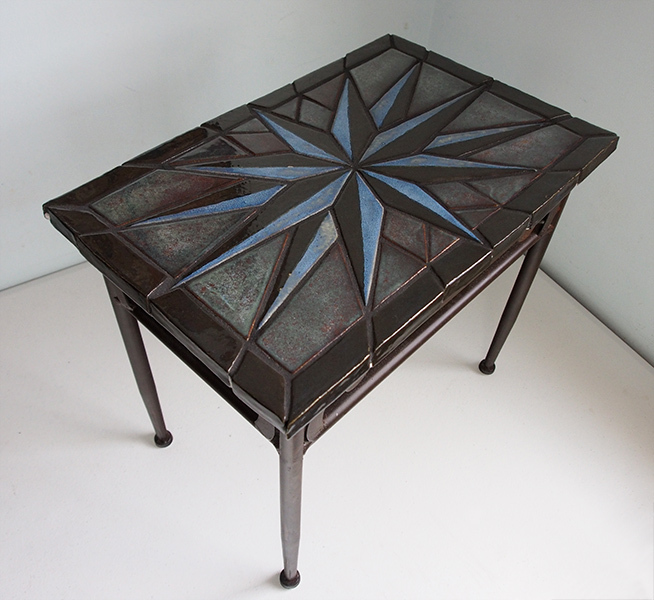 Finished end table with custom mosaic tabletop.